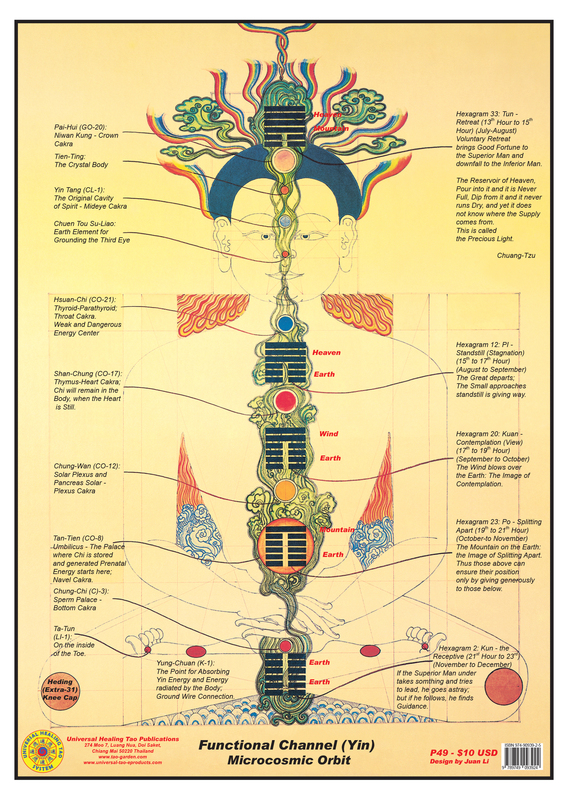 This poster illustrates the Male Body with the Microcosmic Orbit with the Functional Channel Yin with the Eight Forces with the detail explanation surrounding the figure, which is beautifully illustrated by Universal Healing Tao Senior Instructor Juan Li's original meditative art drawings. When we became a fetus in our mother's womb the connection to our mother was the umbilical cord from her body to our navel and from there we formed our body. The energy moved from there down to the sacrum up the spine to the crown (Governing Channel), then down the front of the body (Functional Channel) back to the navel. This is the microcosmic orbit and the energy is still moving or we would not be living; we are just not conscious of it. With this formula we can reconnect ourselves to our physical beginning and become conscious of the internal energy moving in the body. Once we become aware of this movement we can use this flowing energy (light) to heal any internal energy blockage in our body.